Start the New Year off with a family set of the Joshua Code. The Joshua Code and I Can Learn the Bible, the Joshua Code for Kids. This set is a great way to learn 52 verses from the Word that each of us should have stored up in our hearts. 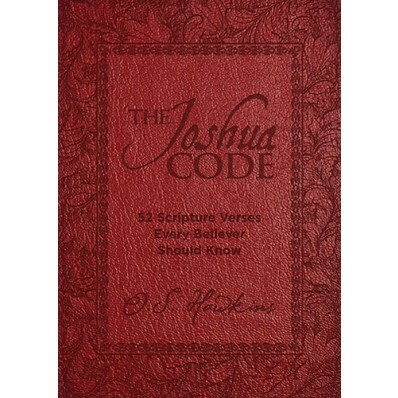 The Joshua Code, 52 scripture verses every believer should know. This book takes a look at 52 verses from the Bible that we should commit to memory. Taken from Joshua 1:8, "This Book of the Law shall not depart from your mouth, but you shall meditate on it day and night, that you may observe to do according to all that is written in it. For then you will make your way prosperous, and then will have good success". Starting with Genesis 1:1, and touching on verses through out the old and new testaments. This book is meant to be used weekly, that you would read the verse, and the commentary and work on memorizing it for the week. I Can Learn the Bible is the Joshua Code for kids. The weekly line up perfectly with the Joshua Code book, making it easy for kids and adults to work on it together for the year! I love that they easily streamline together and give us an excellent venue for memorizing scripture together as a family. We will be using this weekly as our morning devotion before we start our homeschool morning. I really want to not only instill the memorization of scripture in the kids lives, but in mine as well. 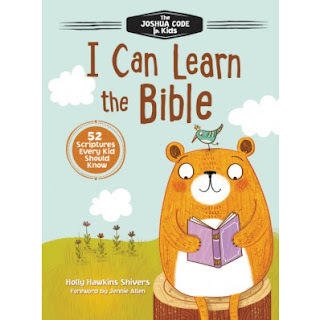 The kid version helps teach the kids the verse and give them meaningful commentary geared toward their level. Enter to win this set for the New Year! 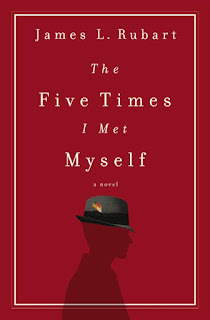 Just a warning... don't start this book in the evening, it is near impossible to put down!! I started reading it around 7:00 and really struggled to go to bed. I would have stayed up all night reading it, but I had a busy day the next day and had to put it down. I couldn't wait to grab it first thing in the morning. One of my latest favorites!! The weaving of Coach's past history and that of many in Heart's Bend, and how it interlocks with Taylor and Jack stories is perfect! They weave together flawlessly. Taylor and Jack are both from Heart's Bend, yet flee to NYC and end up meeting up there. 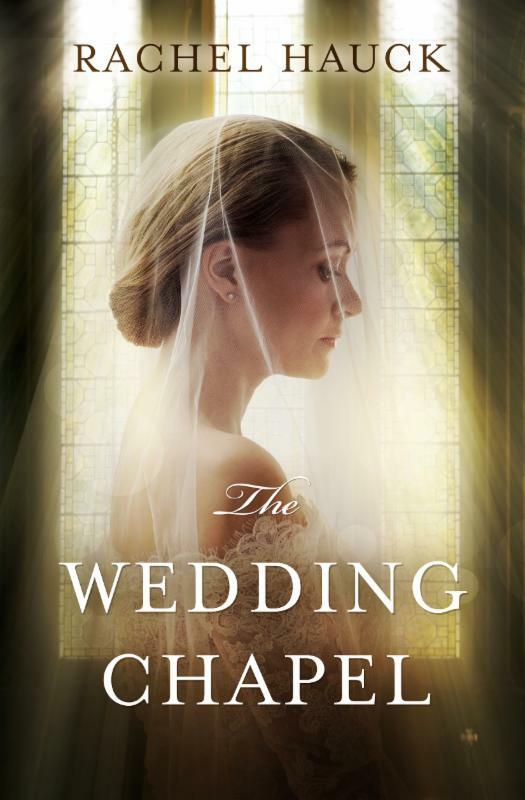 They elope and it seems like much of the book is them trying to learn to communicate and share that love they have. Taylor sees the Wedding Chapel when she is on assignment to photograph it, and the Wedding Chapel really speaks to her. That symbol of the chapel is appealing to Taylor and she truly wishes that the Coach would reconsider selling it. This is a beautiful story of redemption and the heart beat of God. El means all powerful. 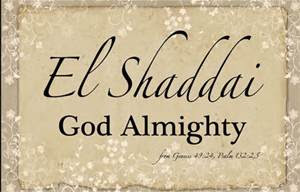 Shaddai means breast. Combined these words mean He is the all -powerful One who satisfies, nourishes, and sustains us. I couldn't wait to see the much talked about War Room. It was just as great as I heard and both my hubby and I were changed and led into more of a meaningful prayer life. I really enjoyed Priscilla Shirer in her role, which for me was the first time being introduced to her. I had heard her name on occasion from friends who were reading some of her books. I up to this point just hadn't had the opportunity. Wow, was I missing out! 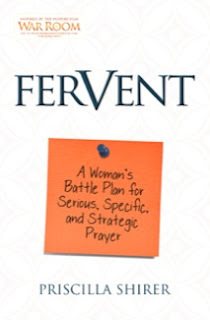 Fervent is one of those books that every woman will want to read. A book to really help you focus your prayer time. And you don't need to have watch a movie to do it! This book is a call to prayer. A call to being as the titles says; serious, specific and strategic. Priscilla helps teach us how to do all of those things, while helping us be alert to the enemy's arrows. This is an active book, one you read and participate in as you work through the book. There are 10 strategies that Priscilla walks you through in seeking to improve your prayer life. 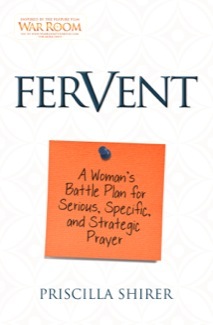 This is not a book ABOUT prayer, this is a strategic plan of attack in a War. Prayer is a powerful tool, and we have much we can be warring against. All battle require a plan, a strategy, and we need the same as we fight against the enemy. I highlighted much of this book in bright pink. The pages are dog eared, and I have re read parts a few times over. This is an amazing book! This book gives you the tools to DO SOMETHING about areas we feel useless to do anything. We do much when we pray! There is room for notes in the back of the book as well as personal prayer cards to write on and put up in your "war room". I have a corner in my room that I use when I rock the baby to sleep. I sit and look at my sticky notes and pray over the things on the bookshelf listed. It is a perfect time for me to get into prayer mode as the baby snuggles off to dream land. No other kids bothering me, and my mind is focused on the plan in front of me. You don't need a 'room ' for prayer, or a closet. You can use any nook and cranny that will take sticky notes or the cards from the back of the book. Also you can post scripture to use when praying over these things. The devil uses the specifics above to get you to think you aren't a prayer warrior. Your fears, past, identity. Priscilla takes those darts from the devil and shows you through the Word how you can be set free from those scripturally. I strongly recommend this book. One of my very favorites, that I have zero plan of loaning out. It is one that I will have a few copies on hand to gift out to those who the Lord let's me know, needs some more fervor in their prayers. I love reading Christmas stories to the kids each season, and always try to pick up a few new ones each year. We could definitely read one per day from Thanksgiving to Christmas! 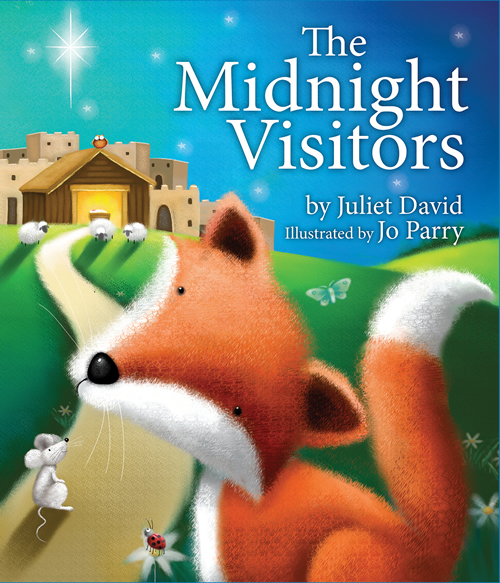 I especially am drawn to the ones that keep the true meaning of Christmas, much like The Midnight Visitors does. This book by Juliet David, Illustrated by Jo Parry is a basic animal tale about the members of the barn, when baby Jesus comes to visit. Written from the perspective of Miriam the cow, she notices that town is getting busier and busier this particular night. She was alone, bedded down for the night when she started receiving visitors on this cold night. First the rabbit family came, then Freddy Fox, and finally a very tired looking man and his wife. Miriam was so full of pride that the baby was born in her barn and laid in her feeding trough. The angels were singing and the shepherds soon came to visit. I really appreciated that the wise men did not visit in this story. In scripture it is actually thought that they didn't get to the Christ Child till he was nearly 2 years old. I very much appreciate even the simple stories that just show the family and the shepherds visiting. The illustrations are delightful to young children. I easily read this to my 1 year old and she really enjoyed looking at the pictures. This was an easy read for a younger child to read to a toddler. The Bible’s book of Genesis and its story of Creation inspired printmaking artist Carroll Harrison Kehne, Jr. to transform his original silkscreen prints into a children’s book illustrating how the earth was born in seven days. 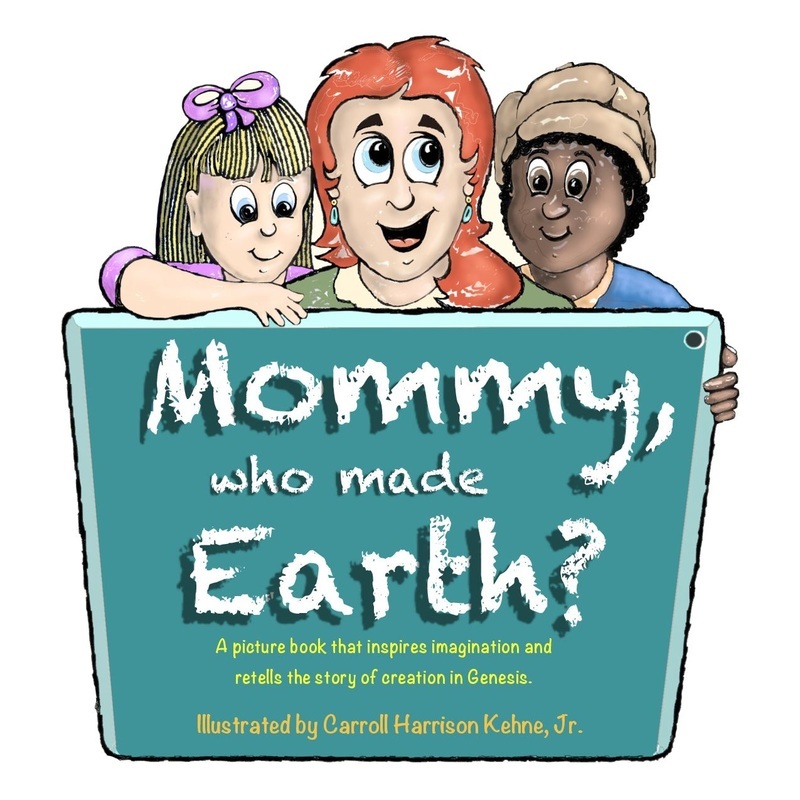 In his book, “Mommy, who made Earth?,” Kehne uses expressionist artwork to retell the story of God’s creation of our world using 27 silkscreen prints, also known as serigraphs. “My pictures in the book aren’t unlike the ones astronomers are presently showing from their space explorations of other solar systems,” Kehne said. 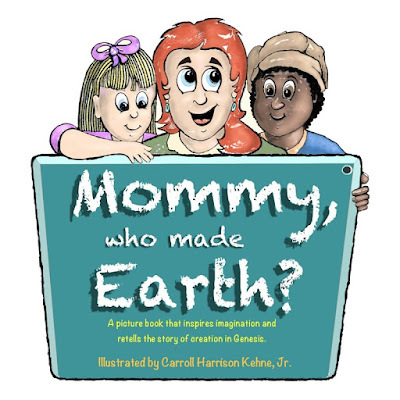 Kehne hopes the artwork, numbers, colors, shapes and patterns in “Mommy, who made Earth?” will help stimulate imagination and artistic growth in young children, and emphasize the important message that children should care for all things God created. 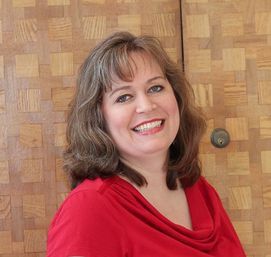 “I hope my illustrations will inform children and cause them to think and ask questions, creating an interactive discussion between a teacher or parent and child,” Kehne said. The illustrations are outstanding! I love how Mr. Kehne took his original silkscreen prints and turned them into a children's book. I love that my kids got to see unique prints of the creation story, rather than the typical illustrated version. I liked that it was abstract enough to invoke more imagination for the kids. I love that they can see a variety of thoughts on what creation may have looked like, not always being a cartoon version. I would love to see my kids take some time to recreate Mr. Kehnes artwork in their own style. For more information about Kehne and his books, visit www.kehnekids.com. The book is in four parts, and 14 chapters. This is much more than your typical picture book. It is more like a chapter book and picture book combo. This won't be a single night read, and what fun to be able to read it for several nights in a row. Now the very ambitious of course can get through it in one sitting. The little brown monkey saves for weeks and months to get enough money to embark on a grand adventure. He first travels to Chickadee Island near Honolulu. Cat and Pelican are on separate journeys and they too are headed for Chickadee Island. The little brown monkey meets up with the Cat who speaks fluent Bumbelbeez so the monkey asks the cat to teach him. Silly words like Boingy-Woingy, and Punya-Munya will keep kids giggling as these character continue on their adventures. In search of a chickadee, the two meet up with Pelican. They continue on finding native foods, and exploring the jungle. Each of the characters has a personality and learn things on the way. They meet other friends including a dog on their way. I would say that this book is best for the younger set. For maybe ages 3-8. The breaks in action in the chapters give you great places to pause if the child is growing tired of sitting still. Some kids will easily be able to sit longer to hear the entire book. It is a fun adventure to see a cat, monkey, pelican and dog travel around to places together. Kids will love it. I love any company that gives back and supports research like these! Dr. Politsky has personal stories in each of these areas and that has led to his support of these particular research projects. My boys are big fans of Marvel super heroes and anything Spiderman or Ironman are must haves! These are a real simple popping toy. You hold it at the right angle, just barely off the ground and it hits and shoots up into the air. The 3 inch figure can fly 24 times it's height. These make great stocking stuffers. I recommend probably at least 6 years old to use it and understand how to drop it just so. Also be real careful not to drop it from too high. They are prone to break if dropped from too high of a distance. They are made of hard foam, that felt much like plastic. They also have The Incredible Hulk and Captain America. 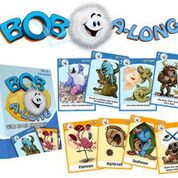 BOB-A-LONG, A WILD AND IMAGINATIVE INTERACTIVE CARD GAME PERFECT FOR THE ENTIRE FAMILY! NEW YORK, NY -- On December 10, (INSERT SOMEONE YOU KNOW) is proud to announce that BOB-A-LONG, the zany, interactive card game for the whole (INSERT ITEM) will be (INSERT ACTION) into the marketplace with a Kickstarter campaign found at http://kck.st/1U5Xd38. When FREAKY PETS™ creator Marcus Ticotin's daughter and her cousins were little, he spent countless hours devising fun, creative and thought-provoking games for them to play, helping them to bond and use their imaginations. Fast forward 25 years to his creation of FREAKY ENTERTAINMENT (freakypetsfun.com), a universe of unique and funny characters originally spun off into online games, a live, touring musical and reversible plush toys, available nationally through Hallmark stores. 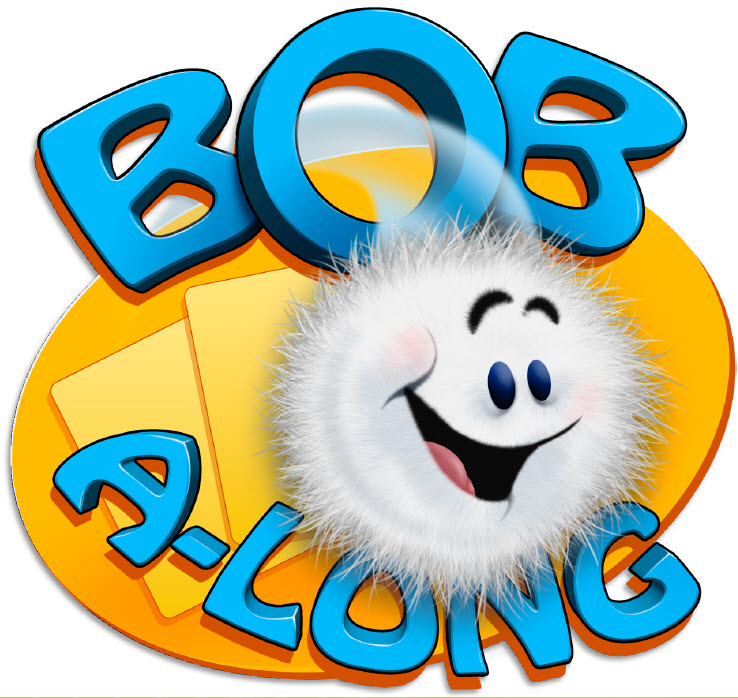 BOB-A-LONG is an offshoot of this highly original universe, and will soon deliver hours of imaginative, interactive fun and laughter for all game lovers 8 years old and up! 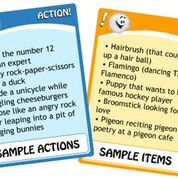 A family card game that inspires creativity, BOB-A-LONG challenges players to bring out their inner comics as they perform charades to get other competitors to guess what's on their bizarre "action" or "item" card, wonderfully illustrated by book artist Kory Fluckiger. Once the card is guessed, it's used to fill in the blanks in an outrageous FREAKY PETS adventure story. Then, game play truly turns zany as the designated reader is given a "flavor" to use while performing the story - whether it's speaking in "pirate", wearing a feathered chapeau or while squinting and leaning to the left. Guaranteed to turn an ordinary game night into a hysterical event, the goal of BOB-A-LONG is to have a BOB-load of fun, while being as creative, zany, funny, as humanly -- or even as non-humanly - possible. 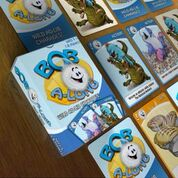 Seeking funds for a production run, the BOB-A-LONG Kickstarter campaign will launch on December 10, offering BOB-A-LONG backers the chance to get everything from a copy of the game hot off the presses and exclusive, illustrated cards not available at retail to reversible plush FREAKY PETS toys, the immortalization of you or your pet into the actual game, a personalized audio recording of the BOB-A-LONG adventure story by a professional actor/actress and more. Stretch goals include "Bob's Shock and Awe Expansion Pack" featuring 10 additional shocking action cards, 10 additional awesome item cards and 5 additional shockingly awesomeatious story cards. Delivering fun and creativity in equal measures, look for BOB-A-LONG to bounce into retail in 2016. And, consumers seeking more information on the game can visit Bobalongfun.com and sign up for exclusive updates! This game reminds me of the one where you ask someone for a noun, verb, name of a person, etc and it makes a funny story. Much more interactive with it being in game form! El Roi, "The God who Sees". Hagar in Genesis 16:13 speaks El Roi the only time in the Word. "You are the God who sees me", for she said, "I have now seen the One who sees me". 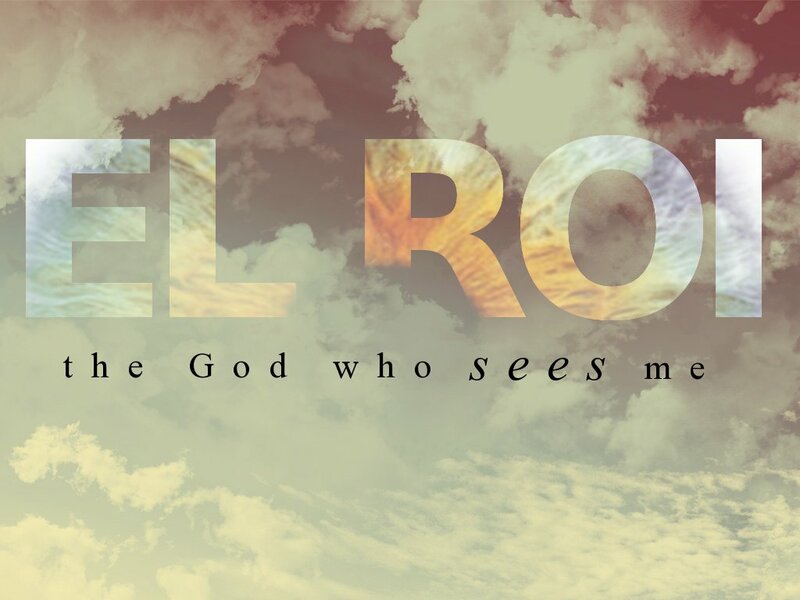 He is our El Roi, the God who sees everything in the Universe. Praise You LORD for being the God who Sees, we are blessed! 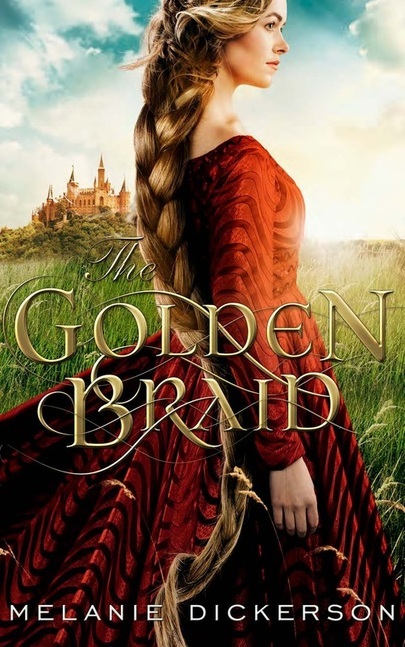 I have LOVED this series by Melanie. It is great to see her take a classic and rework it like this. I love that she modernizes the classic tale, yet keeps the old fashioned elegance about it! These are great for youth fiction, and for adult. I can't wait until my young daughter can be old enough to read these. I know she is going to love them, especially The Golden Braid, as Rapunzel is her favorite. I actually like Melanie Dickerson's version better than Disney! She adds so many extra details that make you really want to dive into the book more. Excellent job, and excellent series! 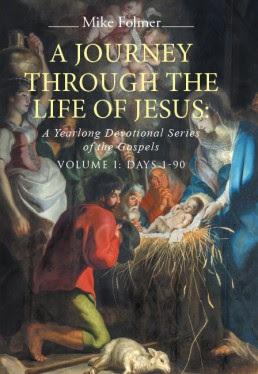 James Rubart is author I have really enjoyed in the past. His books are 'different'. They typically take place on a variety of planes. This book is no different. Brock moves between time, via his dreams. He has learned from a book to control his dreams and to visit himself when he was younger, to try to right his wrongs. He seeks to improve his relationship with his father, his brother, his wife and son. He tells the young Brock and gives him advice. Problem is, when he gives him advice and young Brock changes things, then the events of the future get changed as well. Caught in a spiral he can't seem to control, Brock just wants to go back to his 'normal' life. Whew!! You have to hold on for this one. I had to back up a couple times and try to realize what time we were in, and figure out what things had changed after FB (future Brock) came and changed things in the past. Brock changes his career, his relationships, and even people around him and their relationship with God. Most.. not for the good. 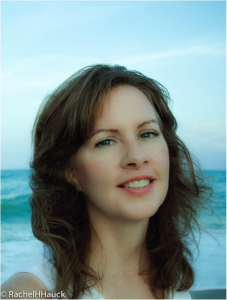 Can God work through our dreams? Can he have us visit another time and change things? He did speak things into being, so why not? Like many of his other books, James Rubart gets you thinking outside of the box and considering a realm beyond the basic one we live in. 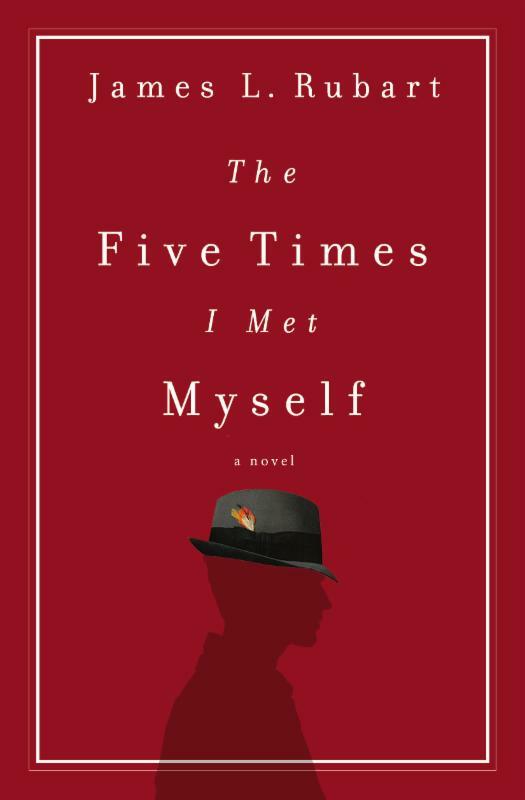 He has a knack for writing books like this, and The Five Times I Met Myself was another great book! 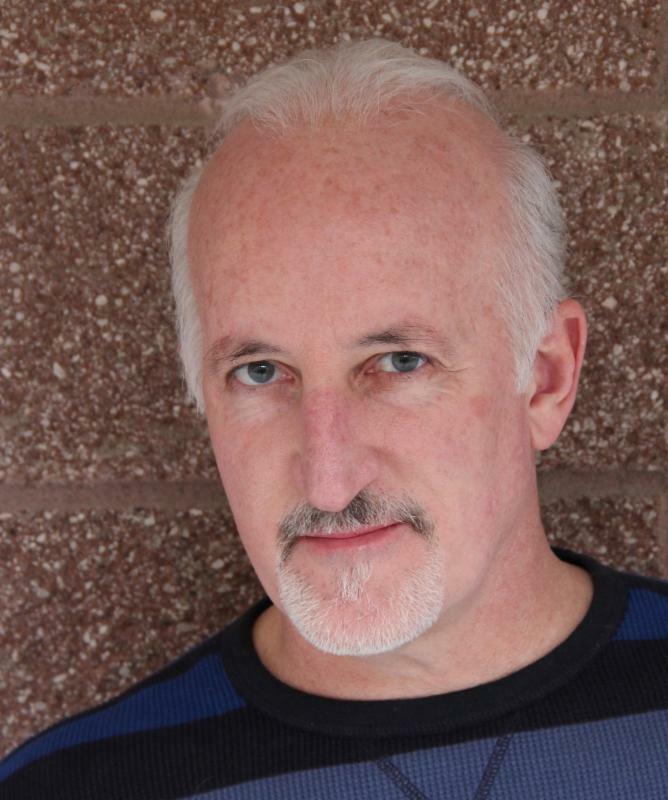 James L. Rubart is a professional marketer and speaker. He is the author of the best-selling novel Rooms as well as Book of Days, The Chair, Soul's Gate, Memory's Door, and Spirit Bridge. He lives with his wife and sons in the Pacific Northwest.